Western blot analysis of whole cell lysates probed with cytokeratin 18/19 antibody (VMA00011) followed by detection with HRP conjugated Goat anti Human IgG F(ab')2 (1/2500, STAR126P) and visualized on the ChemiDoc MP with 2 second exposure. Arrow points to cytokeratin 18/19 (molecular weight 48, 44 kDa). Cytokeratin 18/19 antibody recognizes the keratin, type I cytoskeletal 18 , also known as cell proliferation-inducing gene 46, protein cytokeratin-18, CK-18, keratin-18 or K18. The antibody has been extensively validated for western blotting using whole cell lysates. Human anti Human cytokeratin 18/19 antibody recognizes human cytokeratin 18, a amino acid type I intermediate filament protein expressed by epithelial cells. The intermediate filaments are expressed as heterodimers in epithelial tissues. Cytokeratin 18 (CK18) is often co-expressed with cytokeratin 8 (CK8). The CK18/CK8 heterodimer is the major cytokeratin pair found in simple epithelia such as that found in the liver, intestine and breast ducts. CK18 plays an important role in maintaining epithelial cell integrity. This clone has also been demonstrated to cross-react with cytokeratin 19. Human anti Human cytokeratin 18/19 antibody recognizes cytokeratin 18 as a band of ~48 kDa and cytokeratin 19 as a band of ~44 kDa in western blotting under reducing conditions. 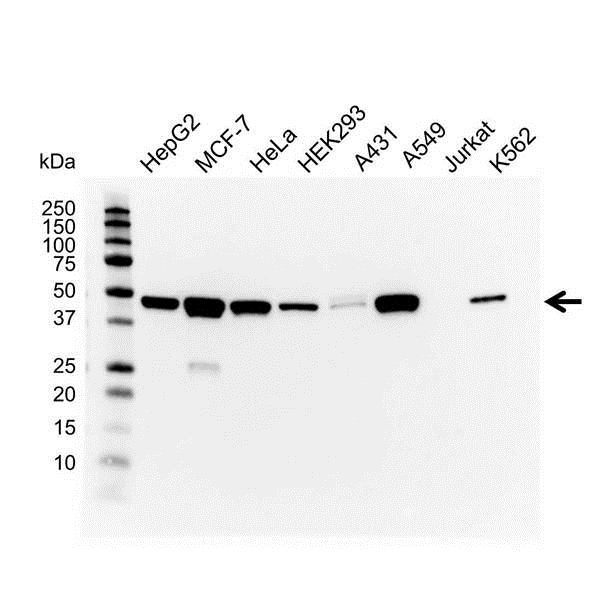 Anti cytokeratin 18/19 antibody detects bands of approximately 44 kDa in HeLa cell lysates.